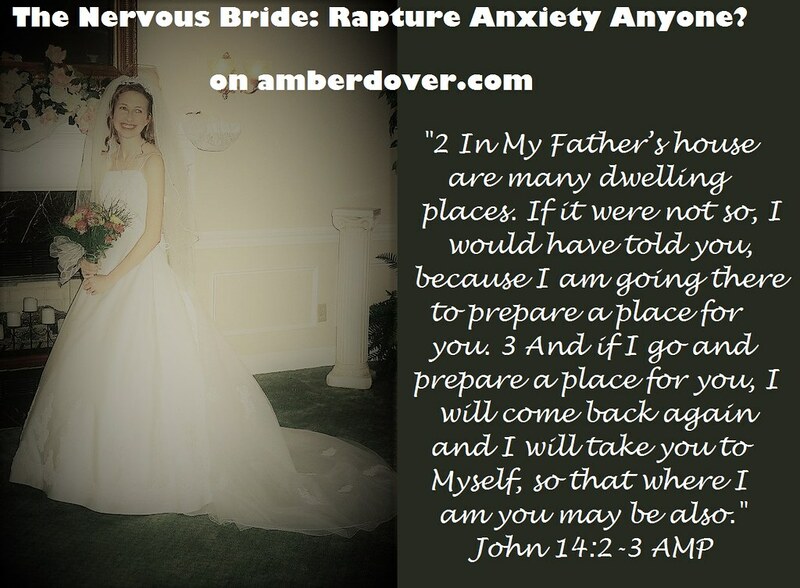 The Nervous Bride: Rapture Anxiety Anyone? Hello, dear ones! I don’t know about you but I feel like a nervous bride again. The morning of my wedding I threw up. Of course, I was happy to be getting married, but the excitement overwhelmed me. What would this new life be like? What if I tripped walking down the aisle? Did I have what it took to be a good wife? So what does this have to do with the Rapture? The Church is called the Bride of Christ. The Jewish Marriage Ceremony is full of symbolism that relates to Jesus’ return for His people. Everywhere I look I see the signs Jesus talked about converging. Prophecies are about to be fulfilled. The Damascus War of Isaiah where Damascus is destroyed forever could happen at any moment. All the key players for Ezekial 38 are lined up. We could not have said that five years ago. Every day there seems to be some apocalyptic weather event in several places around the world. Even unbelievers notice it but they mistake the cause. Israel is closer to rebuilding the temple. It wouldn’t take much to push us into a one-world government and financial system. The stage is set. Then there’s weird stuff like French President Macron comparing himself to a god. This next video was a Godsend to me. This sister outlines the worries believers have. I know my top concern is the salvation of loved ones and will they have a chance to be saved if they miss the rapture. Secondly, I wonder if what I’m doing on this planet is enough. Third, I’m just nervous about the unexpected. I’m excited like I was at my earthly wedding. Jesus making things brand new is awesome! Getting to see my Lord and Savior is awesome! Getting to see family and friends who have died is awesome! Getting a glorified body is awesome! Evil being destroyed forever is awesome! Yeah, so why do I have butterflies in my stomach? I guess the same reason I threw up the morning of my wedding…the unknown is scary. Change is scary even if it’s good. Maybe that is why the Israelites were so stuck on going back to Egypt, and some of them missed the Promised Land? Anywho, this video was an answer to prayer and filled me with peace. I hope it encourages you. Also, I’ll put the world event updates at the end. Praise the Lord…we are secure in Jesus’ love and His love is greater than we can imagine! Info about the Ezekiel War and Isaiah’s Damascus Prophecy. These updates record the earthquakes and volcanic activity each day along with world events. They really are ramping up like contractions!